The Ford F-150 is truly a multi-purpose vehicle and one of the most valuable accessories you can buy is a headache rack. In spite of its good looks, the F-150 is designed to be a work truck. You can find it pulling horse trailers, hauling hay, recreational vehicles, and even livestock. Protecting the passenger cargo from these loads is very important because if the rear window breaks, everyone will be exposed to whatever broke the glass. The headache rack can be custom-made for your F-1150 or bought off the shelf. It can be permanently bolted onto the bed rails or mounted to stake pocket holes. This piece of equipment serves many purposes and protects the rear window from being compromised by shifting cargo. Horizontal louvers are built into the frame and help cut down on wind resistance. The louvers also block out harsh light and provide additional shade in the cabin. 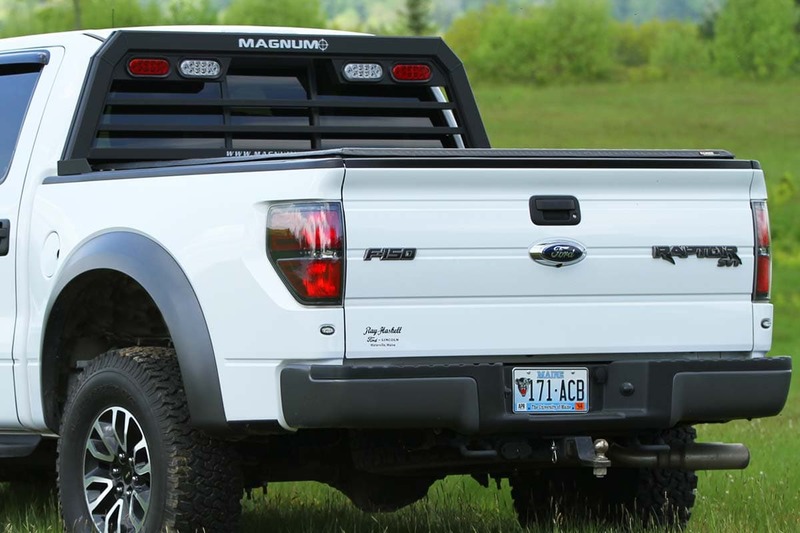 The F-150 is perfect for hauling lumber, lumber, pipe or even a motorcycle in the bed of the truck. However, if you hit the brakes and the load is not properly strapped down, your load may penetrate the rear window and end up inside the cabin. This could cause serious injury to your occupants, and there is a chance that your load could even penetrate the front window. The headache rack is designed as a barrier to prevent injury from a load shift. Headache racks also provide additional protection in a rollover accident. Due to the strength of the steel and location on the cab, it can help prevent crushing injuries. In addition to safety, many racks can be used as a utilitarian device. Depending on the rack you select, the top can extend vertically above the cab of the truck. This gives you the option of hauling ladders and other equipment without worrying about scratching the paint. The louvers are useful for tying equipment securely to keep it from shifting in any direction. Channel systems on some racks give you the option of adding lights and tie downs for additional safety. Reflectors can be added to the sides and top of the rack to give your truck more visibility at night. Whether your need is utilitarian or safety, a headache rack on your F-150 is added value because it is designed to keep your cab cooler, protect your occupants from load shifts and makes hauling loads even safer.